I visited their site yesterday and requested a call back today. Wished I hadn't bothered. Lots of waiting, repetition of details. Never even asked what engine type I had, year, value etc etc. Mentioned 75 Community, no reply or comment was made at all. Their price Ã‚Â£130 more than Direct Line, my present insurers, and Ã‚Â£140 more than Admiral. I'll stick online in future, at least you avoid contact with indolent staff who really couldn't care less. been using them for years had my cars change over to LPG (Liquified Petroleum Gas) never cost any more. I look online each year for a better price, which the best is arould Ã‚Â£30 less. sill stay with them as I find them great to deal with. The deal was only completed yesterday and only posted on the site this morning so if you called them yesterday they would not of heard about us. we will be having a member called Dan that will be acting as a go between you and Adrian Flux. Chartermark wrote: I visited their site yesterday and requested a call back today. As Andy says the deal was only done yesterday and confirmed this morning. There is no compulsion to use any particular insurance broker, just because they are advertising here. AF do offer some options as standard where others charge extra. Shopping around is always the best option. I will pass your comments back to our contact. However, ignore that, 15% off the biggest price in 17 quotes is really an irrelevant value as an overall consideration. With a 'Modification' (have you got one?) in my experience you do get treated differently. I have the contrast personally on this subject specifically with this car to draw the contrast from. If you'd wanted to 'go faster, as a pensioner, you wouldn't pick a diesel in the first place. None of those factors were raised to be counted today - perhaps they don't count in premium calculation any more - just bhp increase? Inevitably when you offer apposite criticism you encourage a reverse 'generalised' rejoinder. My only point here was to advise 'modified drivers' of my experience today, which I can't change. I have pointed out your comments to our contact and one would hope that from here on in the mention of the communities name will engender a more appropriate response. You know me better than to think I would presume any of what you say on any subject would not be the exact case and the whole of the case. Just as an aside we do not charge for advertising, all our traders are here by invitation, offering a service to our community. We have no agenda with regard to this. Most Insurance Underwriting Companies use extra BHP or total BHP nowadays to calculate premiums. I'd been told by others that Flux were worth a call, and seeing them on here jogged my mind. I was disappointed as I thought a broker, in today's online driven market, would have had a more individual and friendlier approach somehow? I think that a corollary of the volume of inquiries or 'churning' on insurance sites, reflects in today's younger respondents becoming somewhat automaton to calls, it's inevitable I suppose in a populatively exponential world. I eventually got a 10% reduction from Direct Line, so I'm going to stay with them, even though Admiral were a tenner cheaper, because the transfer would probably be turmoil in itself. Next year, I'll just probably call them and get their encited premium diminished by a similar sum to avoid the corporate apathy. I got my bank statement today showing Swinton (Car Insurance only) Just nicked Ã‚Â£457,16p for the coming year, and to make things worse, the RAC took another Ã‚Â£126. Ouch!! I have the Synergy2 fitted as well.. So HP should be around 150 BHP ish.. Note, I have to pay about Ã‚Â£30 extra for a 2nd driver, that's included in the above price. And I have never made a claim.. When my ZX got written off by a BMW, "More-than" did nothing! claiming wasn't their problem as I wasn't claiming off them!! even though I was paying them for legal help. In the end I sorted it myself over the phone with the other drivers insurance (Swinton) who were most helpfull and sorted it extremely quickly for me, I had their cheque in less than week I think. During that time I found another similar ZX auto on eBay, went to see it, bought it, and drove it home the same day! .. So I dumped "More-than" and went with Swinton.. The BMW owner (local man) also paid me Ã‚Â£300 toward having some bits swapped over from my old car to the replacement one.. I was with Adrian Flux on my Rover 620ti a few years ago. The one thing that really annoyed me was the sheer amount of paperwork they wanted. Pages and pages of forms to fill out, and photocopies of documents to be sent to them. So much easier with 99% of other firms where you can do it all online and they send you a policy... no forms or photocopies to send off. I insured with AF this year and did not find it too onerous. They sent the proposal form with all the details filled in for signing. and required proof of NCB. Plus everything could be returned by scanning and emailing. Sorry to hear that you feel you did not get the best service on our callback. Initally you would of gone to our Receptionist's who determine the best person for you to speak to. they ask several questions relating to what you are needing, Make and Model, Standard or modified etc and then they will pass you through to the Car Quote team who will go through the Quote with you. Sometimes these systems don't always work as well as they should, I'm quite interested in who you spoke to, To see if any retraining on our staff is needed. If at all possible could you PM me your Name and Postcode so we could locate the file please? 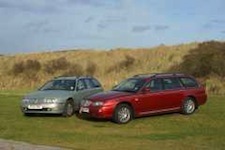 calibrax wrote: I was with Adrian Flux on my Rover 620ti a few years ago. The one thing that really annoyed me was the sheer amount of paperwork they wanted. Pages and pages of forms to fill out, and photocopies of documents to be sent to them. So much easier with 99% of other firms where you can do it all online and they send you a policy... no forms or photocopies to send off. We have been trying to cut down on all the paperwork that is requested by the Insurers. It has improved over recent years and is less then it used to be but does depend on the Insurer you are with I'm afraid. I phoned the number from the club post and got straight through to the Clubline answered the questions from a very helpful and polite lady and got a quote, paid it and was all finished in 10 mins. i can not praise Adrian Flux enough after my experiences with various other insurance companies..
Apples and Oranges though = my post related to having a modified car and the treatment I received within the perambulations of that scenario.